Well, as Gman said on last week’s episode of TRC Unleashed, every college season has its ebbs and flows. If you don’t like what you’re seeing, stick around, because the landscape can change drastically over the course of a week. And boy did it change with yesterday’s win over Arkansas. I’m not saying the ‘Hogs are a quality opponent, because despite sprinkles of talent, they are quite bad. But to go on the road and do that to an SEC opponent…well, let’s just say the Gamecocks’ perspectives, and quite possibly our expectations, have changed a bit. Wild, Wild East. After Georgia’s stirring win over LSU two weeks ago, most all of us wrote off the possibility of a trip back to Atlanta for the SEC Championship Game. I mean, looking down the schedule, who was going to hand the Bulldogs an SEC loss? Much less two? Missouri – undefeated and controls their own destiny, but the loss of QB James Franklin for the season is devastating. It’s hard to imagine they won’t drop at least two games out of Florida, USC, Tennessee, Ole Miss and TAMU. Florida – one loss and controls their own destiny. Yesterday’s loss to LSU doesn’t hurt much as far as the East title chase goes. The Gators still have Mizzou at home, UGA in Jacksonville and USC in Columbia. Georgia – one loss and needs help. But not as much help as us. They hold the tiebreaker over USC, but need Mizzou to lose twice, which as we see above is very possible. A loss to Florida would do serious damage. A late-season trip to Auburn is also looking much more difficult than it did at the beginning of the season. South Carolina – one loss and needs help. We still need UGA to lose at least one more, and need to sweep the rest of our SEC games against Tennessee, Missouri, Mississippi State and Florida. We could still win the East with two losses, but things would have to get seriously nuts for that to happen. Looks like we’ll be doing a lot of scoreboard watching in the coming weeks. D (cardboard cutout of a fence). We gave the defense a hard time last week, not because of the yards and points they were surrendering, but because of when and how they were surrendering them. Yesterday was easily the most complete defensive effort of the season. Aside from the opening drive, the defense smothered a pretty good Arkansas running game, holding the SEC rushing yardage leader Alex Collins to 69 yards. Yes, they rushed for 218 total, but three runs accounted for 124 of those yards, so I’m not going to complain too much on a day when we held an SEC opponent to seven points on the road. We also created turnovers which led to or prevented points. Credit Lorenzo Ward for having these guys ready yesterday. Hampton In. 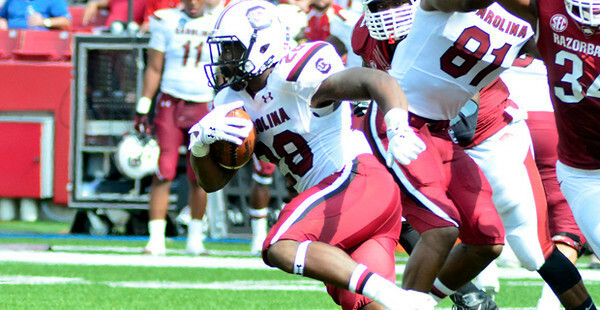 Vic Hampton drew the ire of Gamecock fans and apparently the HBC last week by freelancing a little too much on defense. But he redeemed himself on Arkansas’ second series when he jumped short route, picked off an Alex Collins pass and set up USC’s first touchdown. Team Shaw. 19/28 for 219, 3 TD and no interceptions, and one running TD. ON THE ROAD. And by the way, you “Shaw plays bad on the road” folks, you realize that all four of his career losses on the road were to top 10 teams? You do realize that, right? Boooooooo. No, they’re not saying boo you dummy. They’re saying Bruuuuuuce. Ellington has settled in as the leader of this wide receiver corps, with six more catches yesterday for 96 yards and two TDs. Aside from some early drops, the entire group is looking solid. Jeffery. No, not Alshon, Shamier. He had five catches yesterday. OK, they were only for 32 yards, but still. Welcome aboard Sham-wow. Kane is able. You knew Spurrier was going to throw a couple of balls towards former Razorback Kane Whitehurst in his “homecoming”. Whitehurst blew an early chance with one of the drops mentioned above. But late in the game he hauled in a 15-yard TD from Dylan Thompson to put a little icing on top of the icing on the icing on the cake. King Tuttchdown. Pharaoh Cooper doesn’t have a touchdown yet, but he will soon. Cooper looks just like the Ace Sanders replacement we’ve been looking for in the return game, and oh my goodness the Wildcat. This is high praise, but he reminds me a lot of former Kentucky all-everything Randall Cobb. The Rocket. Ho hum, another week, another 120+ yard performance for Mike Davis. Davis is neck-and-neck with Jeremy Hill of LSU as the top back in the SEC. If he continues to play well, and the Gamecocks continue to win, he might start getting some fringe Heisman consideration. Hog mild. After 22 years, yesterday marked the last game between South Carolina and Arkansas as cross-divisional opponents. We never really developed a “rivalry” per se, but something always seemed right about seeing the Hogs on the football schedule every year. Through the genius and vision of Roy Kramer, we entered the SEC together in 1991, long before schools regularly jumped conferences for money and television contracts. Since then we’ve played each other every season since 1992. They haven’t always been great games, and we’ve rarely both been good teams. It’s been an odd long-distance relationship that has been more frustrating to the Gamecocks than rewarding, so it was good to go out with two straight wins. See you down the road Hogs, best of luck to you. Re: Nosovitch’s nickname: It’s “Freak Nosty”.